I'm thrilled to be working with such a fun and delicious brand today. Thank you Cold Stone Creamery for sponsoring this post. For me, the holidays can feel overwhelming enough without adding a complicated set up to my task list, so I'm sharing a simple and pretty Thanksgiving dessert table to inspire. Luckily there are plenty of ways to keep it easy without sacrificing style. The most important part is the goodies of course. Might I suggest being kind to yourself and buying a few items this year?! With Cold Stone Creamery's line of fall flavors, your family and friends will be thrilled that you added it to the menu. I am obsessed with all things pumpkin. Pumpkin donuts, pumpkin lattes, and, yes, pumpkin ice-cream. Take "made fresh" pumpkin ice-cream, add a graham cracker crust + whipped cream, and deduct 2 hours spent in the kitchen baking? Yes please. 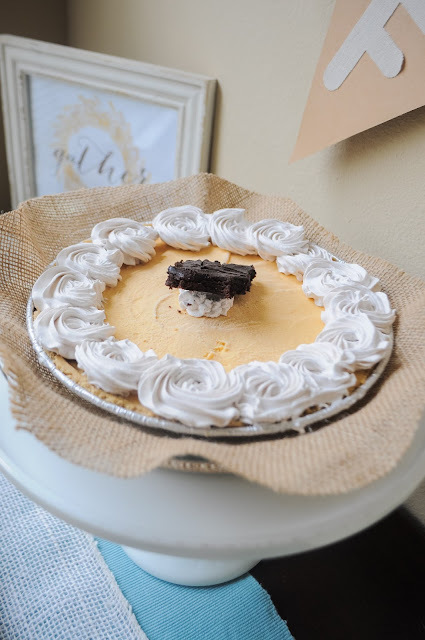 Along with Cold Stone's "Sugar and Spice Pumpkin Ice-Cream Pie," I added pumpkin cupcakes, pumpkin cookies, and pumpkin cream cake to the menu. Next I shopped the dollar spot for a fun banner to use as a backdrop. I always find something there for hosting. 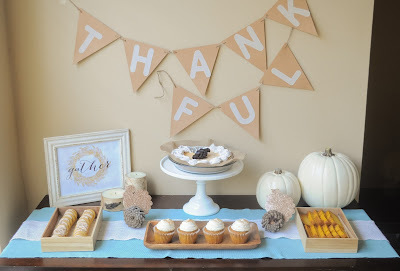 The kraft banner + burlap letters make me swoon. Lastly I found and framed a free printable and then shopped my house for a few rustic accents. Not only is shopping your home more practical than buying new, but it helps you think outside of the box. 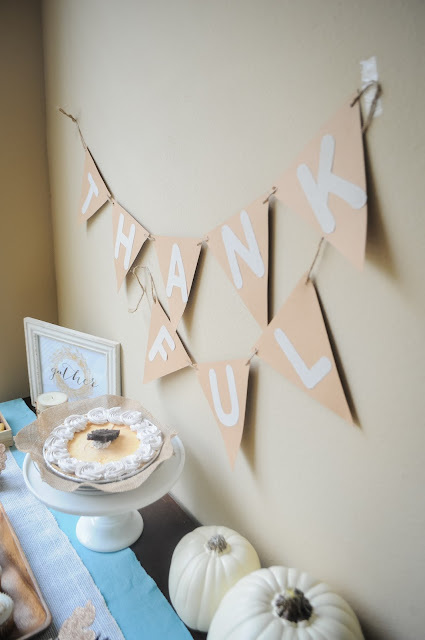 Using a blue runner was an unexpected addition to the shades of brown and white. I did buy one item-- a beautiful cake stand on which to feature the pretty ice-cream pie. 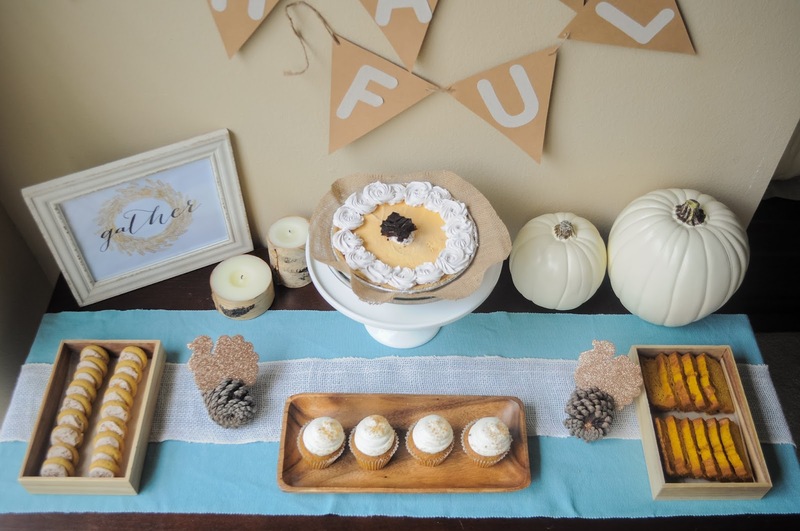 The result is a dessert table that's pretty to look at but more importantly delicious to eat. To order a Cold Stone Creamery cake or pie, visit Coldstonecakes.com and find a location near you. I can say from first hand experience the pumpkin ice-cream cake was pure deliciousness. So pretty! I love all of your thrifty and easy suggestions. Thank you! Shopping your house is sort of addicting! I never knew cold stone had pies! I'll have to give that a try :). 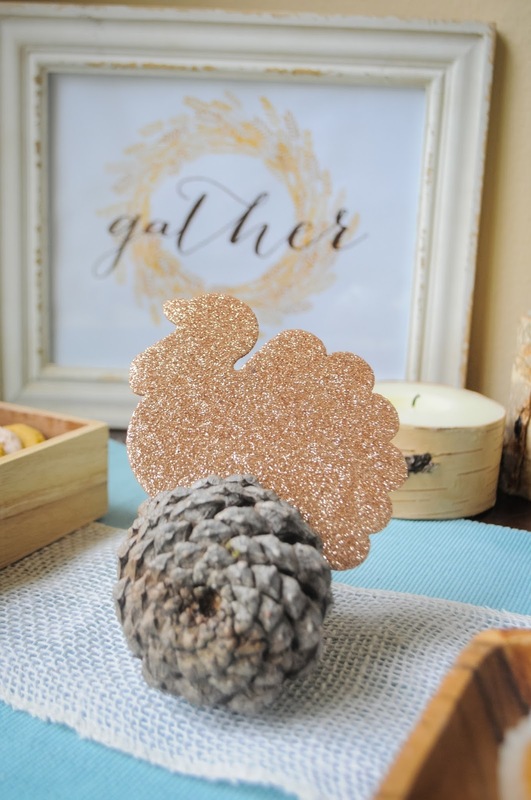 And love your table decor and thrifty ideas! You should seriously try it! It's so delicious! What a fun idea - simple and so cute! haha! just imagine photographing it for an hour. ;) Thanks for reading!! Love this dessert table!! I know Thanksgiving decor gets pushed aside, but you did a beautiful job pulling this table together! Oh yum!! 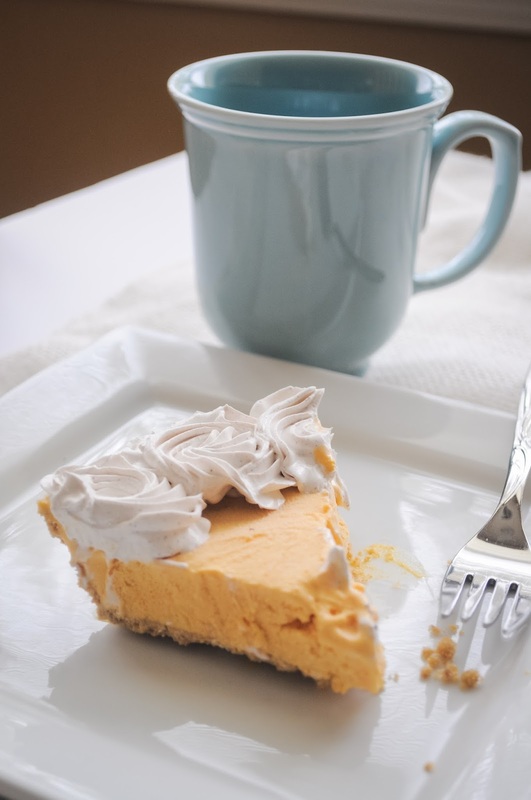 It's not even 10am here yet, but now all I want is pie! !